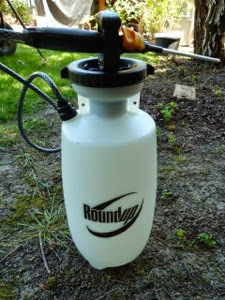 My Home and Garden: I'm very anti Monsanto...imagine how embarrassing this is. I'm very anti Monsanto...imagine how embarrassing this is. I bought this sprayer. It was literally the ONLY one I could find. It is to spray my vinegar weed killing solution. I feel like I need to face the word Roundup away from the neighbours. God forbid!! ps...it is actually the sturdiest and best sprayer I've ever used. Damn!